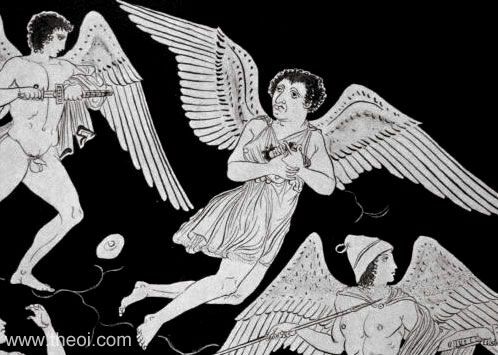 Detail of the Boread twins and a Harpy from a painting depicting Harpies stealing food from the plate of the blind king Phineus. The Harpy is depicted as an ugly, winged woman dressed in a short skirt and holding food. The Boreads are handsome winged youths wielding a sword and a spear. This image is a drawing of the vase rather than a photograph.